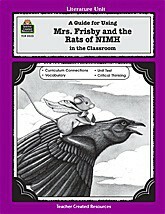 A Guide for Using Mrs. Frisby and the Rats of NIMH in the Classroom. This resource is directly related to its literature equivalent and filled with a variety of cross-curricular lessons to do before, during, and after reading the book. This reproducible book includes sample plans, author information, vocabulary building ideas, cross-curriculum activities, sectional activities and quizzes, unit tests, and ideas for culminating and extending the novel. Grades 3-5. 48 pages. From Teacher Created Resources.